In a small bowl, whisk together butter, Parmesan, garlic powder, oregano and parsley; set aside. 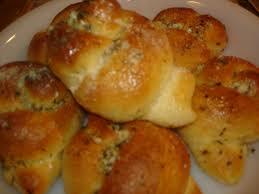 Place knots onto the prepared baking sheet and brush each knot with the butter mixture. Sprinkle with MacYourself™ Cheddar Cheese Powder and sesame seeds (optional). Place in oven and bake until golden brown, about 8-10 minutes. Serve immediately, brushed with any remaining butter mixture.